Pooram Nakshatra (Purva Phalguni star) is the 11th among the 27 stars. The day ruled by this star during the Tamil month of Aadi (July–August) is known as Aadi Pooram. This day is also known as Andal Jayanthi, as Pooram is the birth star of Andal, one among the 12 Alwar saints in Vaishnava tradition. Andal is believed to be the incarnation of Goddess Lakshmi. Andal, being a young girl, attained sainthood by choosing the Lord (Vishnu) himself as her beloved. Aadi month is also dedicated to Goddess Shakti, as the energy of the Goddess is very strong and vibrant during this month. It is believed that Goddess Parvati herself descends to the earth on this auspicious day to bless her devotees. It is also believed that Parvati attained her womanhood on this day and rituals are conducted celebrating this auspicious event in all the Shakti temples as Goddess Parvati is none other than Goddess Shakti. According to legends, Periyalwar, an Alwar saint was living in Srivilliputhur. Being childless, he prayed to Lord Vishnu to solve his misery. One fine day, while he was walking through a temple, he found a girl child in the temple's garden. He decided to adopt the girl and named her ‘Kodhai.’ The child was brought up in Vaishnava tradition of worshipping Lord Vishnu. Over a period, Kodhai’s devotion towards Lord Ranganathar (Lord Vishnu) grew unimaginably. She began to wear the garland even before it was offered to the Lord. One day, when Periyalwar was searching for the garland, he noticed that Kodhai was wearing the garland meant for the Lord. Shocked to the core, he immediately, remonstrated of her behavior. On that night, when Periyalwar was asleep, Lord Vishnu appeared in his dream and said he wished to wear the garland only after Andal wore it. The Lord also advised him to take her to the Srirangam Ranganathar Temple. Though filled with surprise, Periyalwar’s joy knew no bounds. Andal told her father that she would marry none other than Lord Ranganathar himself. 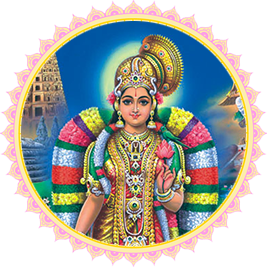 It is believed that when Andal entered the sanctum sanctorum, she merged with Lord Ranganathar (Lord Vishnu). According to another legend, the day of Aadi Pooram is observed as the festival of ‘Valaikappu’ (bangle ceremony) for Goddess Parvati, the universal mother. There is a tale behind this ceremony. In the Trichy district of Tamil Nadu, there was a festival conducted for Lord Shiva and Goddess Parvati. After the festival got over the crowd started to disperse off slowly. In the crowd, there was a pregnant woman who took rest to relax her aching body and was suddenly seized by labor pain. There was no one around for help, and as she was screaming, she eventually started to faint out of tiredness. Goddess Parvati who saw her came to her rescue. She came in disguise of a midwife and helped the woman deliver the child. The woman recognized the midwife to be the Goddess herself, made a vow to celebrate that day as valaikappu day (bangle ceremony) every year, for Goddess Parvati. On Aadi Pooram, many Vaishnavite temples conduct Homas (fire prayers) and Poojas. Aadi Pooram is celebrated with grandeur at Srivalliputtur, the birthplace of Andal. This festival is also celebrated at Srirangam Temple for 10 days. On the 10th day, the divine marriage of Andal and Lord Ranganathar (Lord Vishnu) is celebrated. It is believed that girls who are yet to be married or searching for the right groom, pray to Andal on the 10th day (i.e., divine marriage day) to get married soon and be blessed with the perfect partner. Andal has composed many Paasurams (devotional songs) in praise of Lord Renganathar. Her paasurams are Thiruppavai (30 Paasurams) and Naachiar Thirumozhi (143 Paasurams). After the marriage ceremony, the devotees chant the Thiruppavai and other Paasurams. In all the Shakti temples, on this day, the Goddess is beautifully decorated, and many glass bangles are offered to the Goddess in various forms. Later, the bangles are distributed among all devotees. It is believed that wearing these bangles shall bless the couples who are expecting a baby with progeny. Also, when pregnant women wear these bangles; it shall shield their child from all the evil forces. Lord Shiva himself gave the Swayamvara Parvati Mantra to Goddess Parvati Devi. This enabled her to reunite with her divine consort. Happiness, peace and success will always be important needs of your life -- you may require a dynamic force behind you to achieve these elements in your life.